DayQuil, NyQuil, Advil, Tums, Pepto Bismol,… The American consumer’s medicine cabinet today is a buffet of half-used, cherry-hued bottles of pills and capsules, syrups and bandages. This home dispensary is strong evidence of a flourishing pharmaceutical industry, fueled by our self-medicating culture. Yet how many of these medications do we legitimately need? That is the question that Erik Vance raises in his challenging new book. “Medicine,” “theatrics,” and “belief” are ideas that do not usually fit comfortably under the same roof. 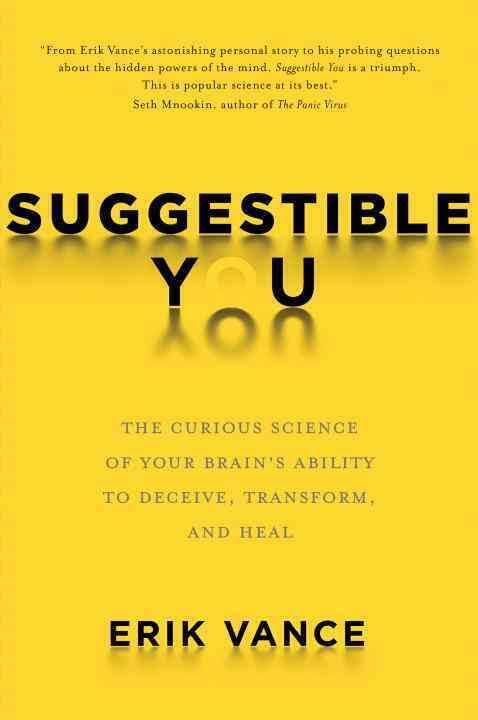 But Vance’s Suggestible You, which tells the story of placebos and their role in human healing, offers up a provocative concoction of science mixed with religion, data and hope. From the Latin for “I shall please,” a placebo refers to anything inert that has an effect on a patient, usually lasting less than a day but possibly longer. Healing powers kick in “the moment we swallow that pill or step into the doctor’s office and see that white coat,” Vance notes. He warns that none of us is immune to placebos, and argues that those who fall under their spell are not weak or gullible. Rather, he underscores the point that placebos and expectation are part and parcel of the healing powers of medicine, and that not all healing relies on hard science. Ultimately the book poses this question to readers: Are we our own miracle-workers, or are we naïve and susceptible to self-deceit? Raised as a Christian Scientist, Vance weaves in folklore, anecdotes, theatre, history, psychology, neuroscience, medicine, and boatloads of research in his account. The result—much like a coalition meeting between the right brain and the left—is an educational, timely, and conversational history lesson as well as a case study on placebo effects. Early in the book, Vance asks us to picture a pharmacist. This pharmacist is shuttling drugs to his customers over the counter. Opioids, endocannabinoids, serotonin, dopamine…. The pharmacist doles out teaspoons of these powerful molecules to treat pain, depression, anxiety, irritable bowels, nausea, and addiction. Vance then tells us that this pharmacist is our own brain, which he argues has the power to dispense its own drugs and create its own cures. He goes on to cite the story of a patient in a 2010 academic study with advanced Parkinson’s disease, who, after supposedly being given a “cutting-edge medication,” (it was in reality a placebo), got up from his wheelchair and began running around again. Driving this book is the idea that medicine relies as much on theater as science. For the purposes of research, Vance visits a Mexican brujo, or witch doctor, whose office looked like “…an antiseptic cross between a doctor’s office and my grandmother’s sitting room…it’s not the dark bat-infested lair I had hoped for—it’s a tidy little room that smells of hospital disinfectant and has plastic amulets and glass crystals in neat little rows on shelves.” The witchdoctor, who, according to the author, “looked more like doctor than witch,” offers to cleanse Vance’s spirit with a concoction of egg, basil, and a couple of squirts of “envy blockers, bad-energy protection, and a liquid that makes wealth.” Vance expects to react with skepticism to this quaint medicine, dispensed in an “exotic theater…out of Harry Potter.” Instead, he comes to the realization that what enchants us today is the theatre of modern medicine. We have learned to associate the rituals of healing practices–the smell of hospital antiseptics, the taking of medicines, talking to white-coated doctors—with healing itself. Vance illustrates the power of suggestion by tracing the history of medical theatrics, from hypnotherapy and magnetic healing water to traditional Chinese medicine and acupuncture; later on, he recounts research initiatives by the Food and Drug Administration and National Institutes of Health to document the placebo effect. Each account is followed by dozens of academic studies on the effectiveness of placebos in neuroscience and psychology. And with each account, we begin to see that the lines between medical science, belief, and the emotional intelligence or charisma of the medical professional are blurred. Vance begins the history lesson by conjuring the spirit of German physiologist Franz Mesmer, who harnessed the “magnetic transference” properties of a glass of water to heal patients. Vance notes that Mesmer was successful not because of the scientific merit of his medical practice, but because of his charisma. After he “played strange music and turned the lights down low” in his salon, the idle rich 18th century French womenfolk who made up his clientele left the sessions convinced they were healed. The dawn of the 19th century brought with it Samuel Hahnemann and the birth of homeopathy. As a keen observer of human nature, Hahnemann was fascinated by various remedies, and hypothesized that it was not the chemical itself that brought relief, but the essence of that chemical. He deduced that one could mix the cure with water until the compound was so dilute it was almost nonexistent, leaving behind the water which would convey that essence to cure the patient. We in the 21st century today may not have evolved very much. Vance interviews scientists like Dr. Kathryn Hall, a “well-meaning hippie on a quest to undermine the big bad pharmaceutical industry,” who studies placebos to “make drugs better, not to undermine them.” But placebos have been historically dismissed by pharmaceutical companies as too vague in their effects, “too psychological,” and unworthy of further study. Vance laments the slow development of placebo research, recounting the difficulty faced both by scientists, who are trying to isolate specific gene pathways that might provide a biological mechanism for the placebo effect, and by the private sector, who have to fund this kind of research because public agencies typically won’t touch it. Despite the laborious and expensive drug developmental process, Vance points out, a third of the world’s top ten blockbuster drugs are aimed at conditions known to respond to placebos, like pain, arthritis, and asthma. To those of us who consider ourselves discerning and rational consumers, we usually think of placebos as suspect herbal teas, homeopathy, and other home-made remedies from our superstitious grandmother. Vance treats the subject matter with neither kid-gloves nor a brazen dismissiveness. Dispassionate towards both the scientists and religious fanatics, Vance’s even-handed approach convinces us of the power of placebos. Diane S. Lye is completing her Ph.D. in the Weck lab at the NYU Molecular Design Institute. While her scientific work is on supramolecular block copolymers, she prefers reading and writing about matters lying outside of her research scope.